Clary Fray is seeing things that can’t be real. Demons and Vampires are popping up all over the Manhattan she knew and loved. When she notices a group following a boy through a club she knows she has to do something, but she doesn’t realise who the group are or what the so-called boy is. This is her first sight of shadowhunters and she doesn’t like what she sees, at least not when she thinks the person they are slaying is an innocent. Clary soon realises that few of the people she thought were normal humans like her, are not at all and there is more to her life than she ever even dreamed of. Ok so I’m going to start this review off by saying if you are a fan of this series, you may not want to read on. I know so many people who love this series and have told me time and time again to read it… and now I have I honestly don’t know what the fuss is about. The story was predictable and dull.. The real action didn’t start until halfway through by which time I already worked out the big reveal at the end of the book, or half of it anyway. I thought the world building was a little slow on the uptake and then not fully explained properly and I didn’t really get much from what was explained either to be honest. It all seemed a bit like the world was ours as we know it with some of the creatures known from other books thrown in. The writing was good but I wasn’t a fan of the third person narrative voice at times, especially at the times when I wasn’t sure which person the ‘she’ or ‘he’ was referring to, and that happened a fair bit. I liked the dialogue and the witty repartee that Clary and Jace had going on but even some of the things that were said didn’t sound like the average teenage way of talking, especially not from Jace. I liked the characters but there was nothing majorly distinctive about any of them. Clary appeared to be a pretty awesome character at first but then proved herself to be a bit too mild and meek for me towards the end, I guess I shouldn’t complain though because I doubt I’d wanna come face to face with warewolves and demons! Hodge stood out as a pretty distinctive character and so did Brother Jeramiah but other than that they all fell a little flat I’m afraid. I don’t mean for this entire review to be negative, the book can’t be that bad otherwise I would have given it up and I am planning on checking out the other books in the series just in case they get better for me… hopefully they will and I’ll have better things to say about the next! 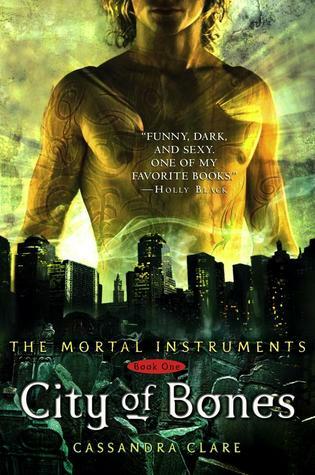 City of Bones is the first in The Mortal Instruments series and was published by Walker in 2007. My copy was purchased from a local Waterstones.